Finding things in Hong Kong is easy, as long as you know where to look. Knowing where to look is the hard part. Things in Hong Kong are often sold in concentrated areas. There aren’t many general stores where you can get everything, instead there is something like a street devoted to selling bathroom fixtures, or a building with dozens of computer parts stores. There also is very little online shopping. If you’re trying to get something, it’s a question of finding out if this cluster of stores exists for the thing you’re looking for. For example, I thought Hong Kong had very poor selection of headphones, because in my computer market (the one I go to is in Mong Kok) they only had crappy brands and poor selection. Later I found out that actually headphones aren’t sold at the computer market, and that there is another market a few blocks away specializing in headphones that had all of the brands I wanted. It’s difficult to determine which cluster the thing you’re looking for is in, if that cluster even exists, and where it is located. Sometimes there is only a vague, outdated post on Geoexpat. So, when, after much searching, I find the location of an obscure item, I sometimes like to give back to the global internetworking knowledgesphere by writing a post about it. I’ve been enjoying Vietnamese food since freshman year of college in Houston. There is a Little Saigon area of Houston with a ton of excellent pho restaurants, and I often went there to enjoy a bowl of delicious rice noodle soup. My favorite beverage to enjoy with these is Vietnamese Iced Coffee. This is served by bringing out a miniature, single-serving metal coffee brewer/filter. This is placed over the cup and hot water is allowed to drip through the ground beans and turn into coffee. This is mixed with ice and sweetened condense milk to make a delicious drink. After introducing a friend in Hong Kong to pho, she said she really loved the the way they made the coffee and wanted to try making it like that in her apartment. 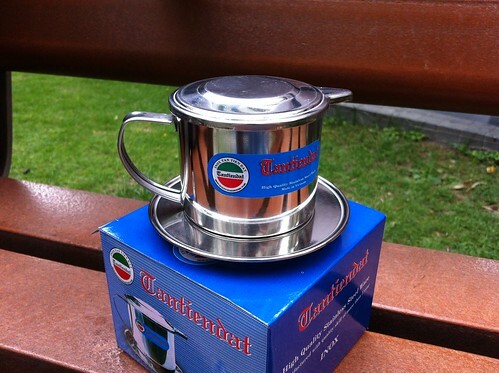 As the experienced Hong Kong expat, I set out on a mission to find the required miniature coffee brewer. We comparison shopped the surrounding area and found that the whole area was full of restaurant supply stores, and a good portion of them had the coffee brewer. The prices are similar to what I found on websites in the US. They ranged from 42 HKD for the smallest, lowest quality one up to 200 HKD for a nicely polished, luxury one. There were kinds with screw-down insert and also kinds with a gravity insert, kinds with a handle, and kinds with the weird plastic stubs on each side. We settled on a 65 HKD one which had good capacity and reasonable quality (the company was Tantiendat). To find this “restaurant supply” cluster go to Yau Ma Tei station and take exit C. Then walk west on Man Ming Lane until you hit Shanghai Street. Then you can just wander up and down Shanghai Street looking at the various stores. The location is Yau Ma Tei (油麻地) district on Shanghai Street (上海街) centered around Man Ming Lane (文明里). Those looking for baking supplies (especially for baking cakes), quality knives, and all kinds of pots and pans might also find what they are looking for in this district.